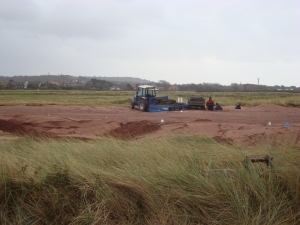 Improvements to the golf course at Royal Liverpool (Hoylake) are in progress at the moment – I gather it’s a £600,000 project to improve drainage on the links course. 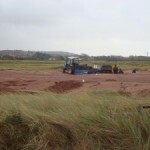 The course is still being played – temporary greens are being utilised. 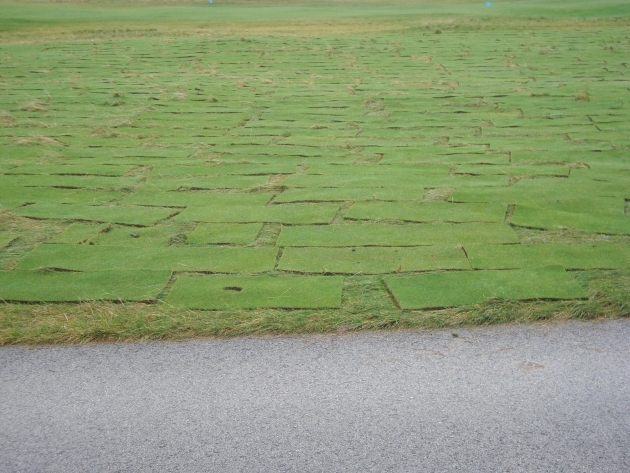 As you can see from the photo above, they’ve carefully peeled off the grass on one of the greens and laid it out on the rough. Look closely at the piece in the foreground …is that the hole? I also noticed on my way home along Meols Drive the other day, the field to the left of the old Leas School site, they were taking turf from there, maybe they were growing it there for golf course use. It was used as a parking area for the ‘Golf Open’ if you remember. There are 2 projects going on, one is an irrigation project (due to the breakdown/leakage from the current system) and another is phase 2 of a ‘Links Review Project’ which was started last year. 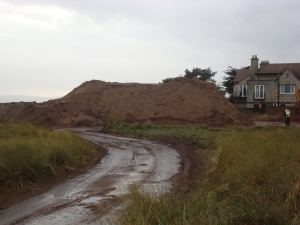 One of the major pieces of work is the relaying of the 17th Green (1st for the Open), this will be reduced in size with the bunkers reworked to be more like the original 17th green that was removed a few years ago (due to being dangerously close to the road). Overall with improvements on almost all holes, the course should be an even greater challenge than ever, none of the changes are designed to make life easier, so I would expect the links’ reputation of being ‘tough but fair’ will be enhanced. Many of the changes are to bunkers which will be better positioned, reduced in size to help hold the sand in the wind and reflect the positions that the current top players are likely to want to put the ball. Expect to see a bit more gorse; tough run-offs into the rough or bunkers; uneven ground in the rough and championship tees pushed back! 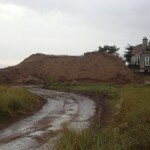 All will be done with the approval of the R&A to ensure that they are in great shape for future Opens… exciting times! Hi Paul – thanks for the comment and information, interesting stuff !